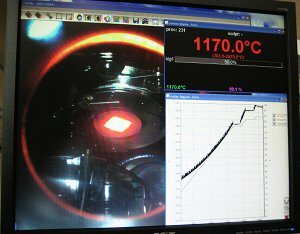 Temperature is one of the most important physical parameters for the epitaxial growth of thin films. 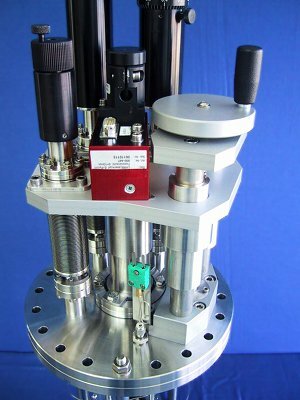 Generating high temperatures in UHV applications is always a compromise between the requirements of the process and the available heat sources suitable for these temperature and process conditions. For conventional heaters, the individual vapor pressures of the component materials of the heater add up and generate a partial pressure that could limit the achievable UHV conditions and deteriorate process quality. 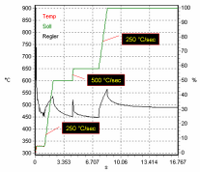 This problem even increases with temperature and with the demand for oxidation resistance of the heater material. In addition, the heat capacity of the heater assembly limits the heating/cooling rates. These conventional radiation heaters are available from SURFACE in different sizes – for substrates from 5×5 mm2 to 150×150 mm2 – and are suitable for up to 1000°C. 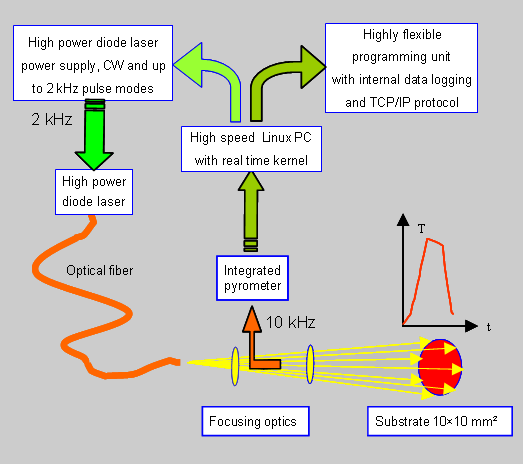 The infrared laser light is guided by a fiberoptic cable to the substrate. Laser spot position and size are adjustable to fit your needs. 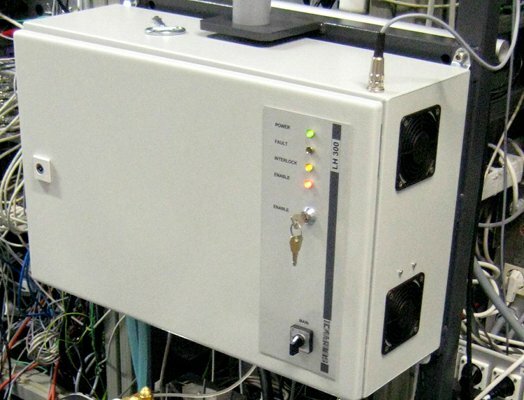 The laser power is controlled by an integrated feed-back loop using a high speed pyrometer. 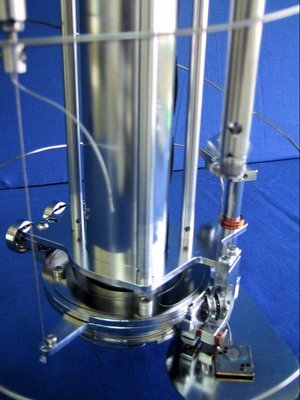 The substrate manipulator includes a thermocouple, mounted to the substrate shutter, to calibrate the setting of the pyrometer emission coefficient. 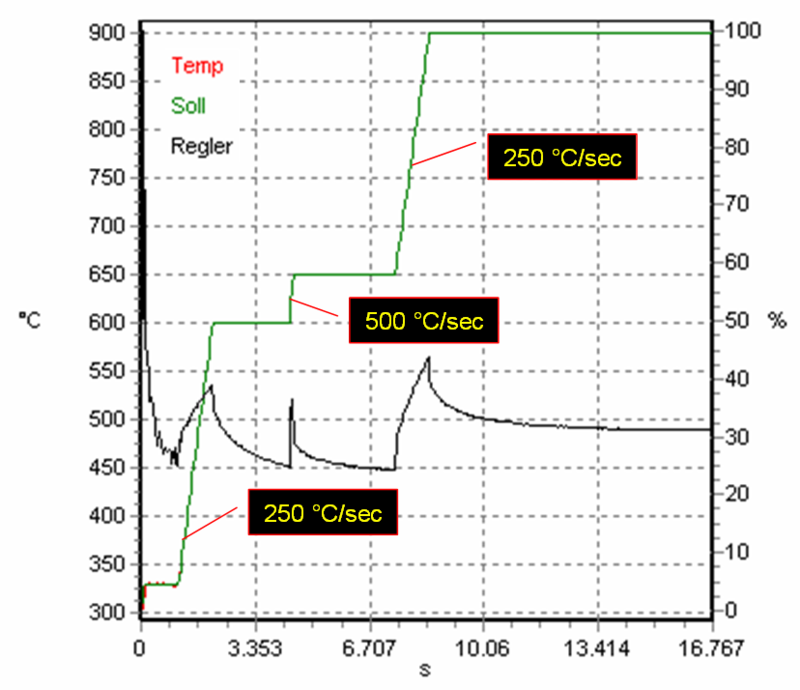 Temperature of a 10×10×0.5 mm3 Si substrate, heated by the SURFACE Laser Heater system. Note that the temperature follows precisely the programmed setpoint! 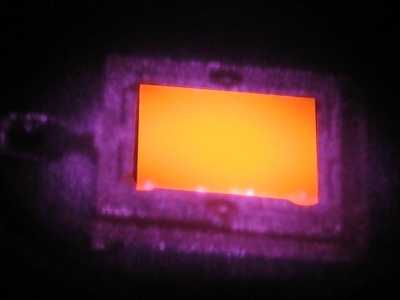 Many commonly-used oxide substrate materials such as SrTiO3, Al2O3, or rare earth scandates are transparent in the near-infrared range. If backside coating is not acceptable because of its complications and limitations, CO2 laser heating may be a suitable alternative. In combination with a beam shaper/homogenizer, a “top hat” beam profile can be achievend that will result in a homogeneous temperature of the substrate, similar to the diode laser. 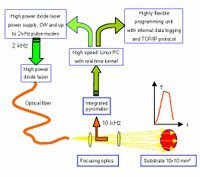 SURFACE can deliver a modified laser heater assembly that integrates the necessary beam line components. 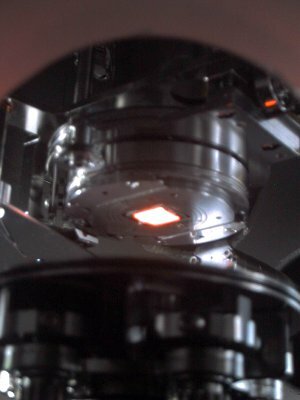 Substrate heated by laser heater. Note that only the substrate is glowing, not the holder.